One of my most favorite and special presents is a new table that my Daddy made for me, yes MADE FOR ME! It kinda looks like this only a million times better, it's white and has a shelf. Like my drawing? He is crafty like me...I mean where do you think I get it from? So it is built to perfection, like not one measurement off. Once I get it behind my sofa I will take more pics and share them- but I was too excited to wait to post so this drawing will have to do for the moment. I also got a new laptop because two special people knew that my old one was no good for blogging- thank you Mom and Dad!! So you can't really see it, but just know that I am posting on it now and it is just perfect, blogging is so much faster now! I hope Santa was good to everyone out there in blog land! can't wait to see it in it's resting place. have a happy new year! Oh I bet the table is wonderful. Can't wait to see it. Glad you had a very merry Christmas! I'm sure the table is lovely, but more importantly, it was clearly made with love and a gift to treasure forever! Luky you! It must be gorgeous! Lucky! 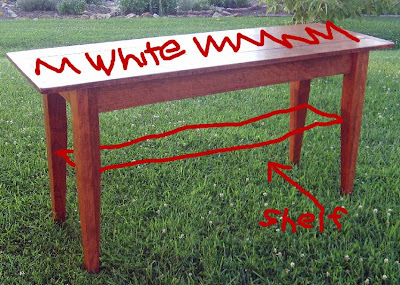 I wish my dad would make me a table like that, how sweet! What an incredible gift!! How lucky are you?? WOW!! how amazing! i got a laptop tooo~ yay for macs..i hope to be a blogging whiz now once i learn ow to save! Yay! You finally got your table!!! Post pics soon! How awesome to have a piece of furniture made by your dad!